In this post we’re going to recreate Sniper Elite’s killshot cameras. This post is written using Unreal Engine 4.12.5 so your implementation might differ in case you’re working with a different version of the engine. You can download the final code revision from my GitHub repo. Before we start recreating this mechanic, let’s take a step back and analyze how everything works. The mechanic is triggered when the character that we’re shooting at is going to die. For the sake of simplicity, we’re going to assume that every enemy character dies with one shot only. For the rest of this post, a successful shot will be considered a shot that hits an enemy target. We make a transition from a First Person Camera view to a Third Person Camera view in order to see the character that fired the shot. After a specified time, we transition from a Third Person Camera view to a camera that is attached to the fired projectile. The moment that the enemy character hits the ground, we transition from the active camera to First Person Camera view again. For this project, I’m using the First Person C++ Template that comes with UE4. Before we achieve the end result shown in the video above, we will modify some functions and properties that come with the c++ template. This means that we’re going to strip down some functionality and add our own. In order to switch a perspective, we’re going to use a new camera that is attached to a spring arm component which is attached to our character’s root component. SpringArm and Camera components init. In case you’re wondering how I came up with these values it was just by trial and error. At this point, the active camera will change when the character fires his weapon. However you won’t be able to see the fired projectile just yet. This is because the projectile that comes with the First Person C++ Template contains an initial speed. This means that by the time you switch the active camera the projectile will have moved “a bit” forward. 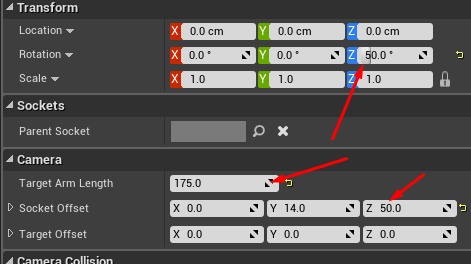 Before we modify the projectile class that comes with the demo to suits our needs, we need to inform the character’s controller that in case we attempt to set a new view target, the controller will search the new target’s hierarchy until it finds a valid camera. Then, it automatically activates that camera. Create a Spring Arm Component attached to the root component. Create a Camera Component attached to the aforementioned component. Since the World’s time is dilated we need to apply a velocity multiplier in order to adjust the movement speed of our projectile. This is done because we need to find a “sweetspot”, meaning that the projectiles should not travel too fast or too slow either. Adjust the initial life span to 0.f. This is done because we want the projectile to exist until it hits somethings. Please note that we’re not going to modify the OnHit function just yet! 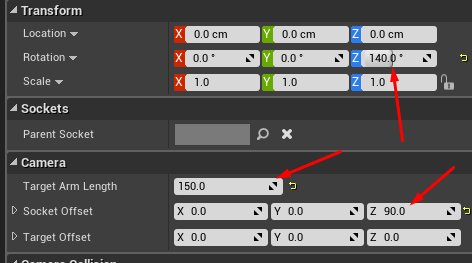 Execute the ActivateProjectileCamera function after the ThirdPersonToProjectileTransitionDelay seconds. Let’s continue on Step 4. Create the camera transition (this step includes 2 more sub-steps). 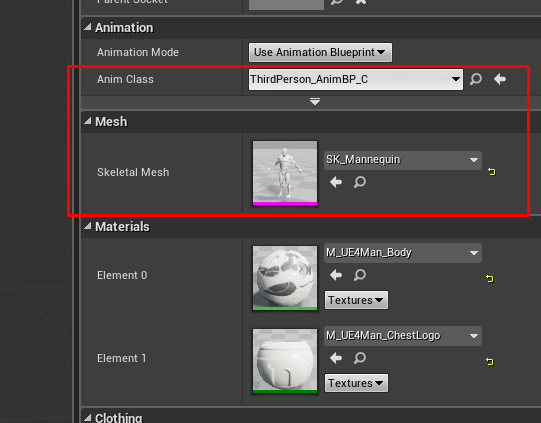 In this post, I’m going to use the skeletal mesh with the animations that reside in the Third Person Template Project. So, before we dive into our code, create the mentioned template project, and migrate those assets to your project. When you’re done with that, create a new C++ class which inherits from the Character class (in my case this class is named DummyEnemyCharacter). Then, we’re going to create a SpringArmComponent and a CameraComponent (just like in our projectile’s class) in order to achieve a camera transition. // Set this character to call Tick() every frame. You can turn this off to improve performance if you don't need it. The distance between the projectile and the enemy in order to create a smooth transition. That the projectile will hit an enemy. Up until now, we’re transition from the character’s camera to the projectile’s camera even if we don’t hit an enemy. In case our spawned projectile hits an enemy, we’re going to store a reference to that enemy before the actual hit, so we can transition to his camera and see the hit result from that point of view. This reference will come from the Step 4.2.2 which is written below. For now we’re going to assume that we have a valid reference and focus on calling the camera transition. Save and compile your code. Then, let’s move to the next step. At this point, if you place a DummyEnemyCharacter blueprint in your level and shoot him every camera transition will work. However, the projectile will stop the moment it hits the enemy. Don’t worry about that, we’re going to fix this in Step 5 which is written below. Moreover, at this point, only the projectiles that are lethal slow the world’s time. Save and compile your code. You have re-created the cameras transition successfully!